In 2017 the Honored Architect of the Russian Federation, Pavel Afonin, would have turned 97, and the accomplished architectural illustrator from the United Kingdom, Edward (Ted) Arthur Milligan, 96. Afonin marched all the way from Moscow to Berlin and was severely wounded during the Leningrad offensive in 1944. Edward’s aircraft was shot down by the Germans; he was captured and sent to a prisoner-of-war camp at Bankau (modern-day Bąków, Poland). The Germans marched their captives westwards to Luckenwalde, south of Berlin, ahead of the advancing Soviet troops. Here their paths touched: Pavel was building crossings where the retreating German army was destroying bridges. Edward was liberated from the camp by the Red Army in April 1945. 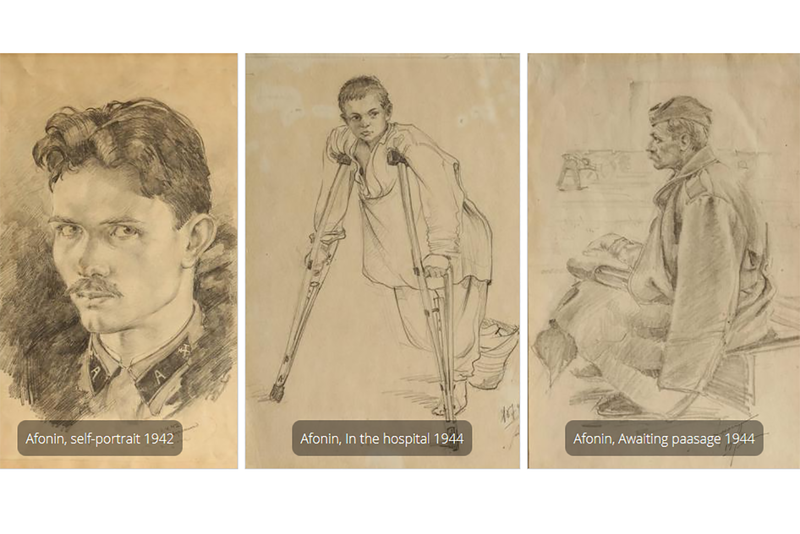 Before the war, each shared a passion for drawing and dreamed of becoming an architect. Both remained faithful to their artistic calling and credited art as their salvation as they steadfastly endured all the hardships of the war. Pavel drew during the rare lulls between battles: in a dugout, in a hospital. Edward took lessons in drawing from Adrian Heath, his fellow inmate and prominent post-war abstract artist as well as the history of architecture. He sketched portraits of fellow inmates, recorded the grueling march and designed buildings he dreamed of constructing in the future. The exhibition is organized in support of the UK-Russia Year of Science and Education. It marks the end of the Second World War in Europe and the anniversary of St. Petersburg State University of Architecture and Civil Engineering.